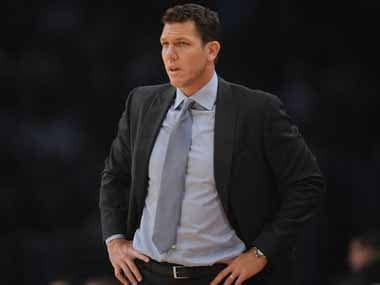 Los Angeles: LeBron James joined a select group of NBA players to score 32,000 career points but nevertheless endured the most lopsided defeat of his career on Tuesday as the Indiana Pacers routed the Los Angeles Lakers 136-94. 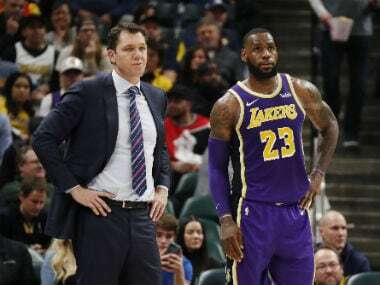 "It was good to see LeBron take off and go dunk one and kind of trust his body," Walton said, although otherwise there was little positive to find in a game that saw 19 Lakers turnovers lead to 33 Pacers points. Fans in Indianapolis rubbed in the rumors, yelling "LeBron's going to trade you" at Lakers guard Brandon Ingram as he went to the free throw line. "That's just fans being fans," James said. "If you let that bother you, you're in the wrong sport." However, he admitted that the trade talk could be tough on younger players. "They’ve just never been a part of it and they're hearing it every single day," he said. 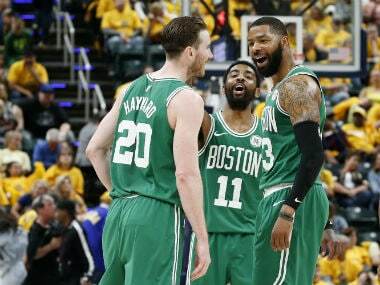 "I'm on my way to being myself again," said James, who connected on seven of 12 shots from the field and became the fifth player in NBA history to pass 32,000 points for his career. The Los Angeles Clippers rallied in Charlotte, where forward Tobias Harris drained a floater in the lane with 4.3 seconds remaining to give the Clippers a 117-115 victory over the Hornets. All-Star point guard Kemba Walker led Charlotte with 32 points and nine assists, but it was Marvin Williams who took the Hornets' last-gasp attempt – firing up an air-ball as time expired. In Oklahoma City, Paul George scored a game-high 39 points and Russell Westbrook notched his seventh straight triple-double – his 20th of the season – with 16 points, 15 rebounds and 16 assists as the Thunder downed the Orlando Magic 132-122. The Toronto Raptors, chasing the Milwaukee Bucks for first place in the Eastern Conference, overcame the 76ers 119-107 in Philadelphia. Kawhi Leonard led the Raptors with 24 points. Serge Ibaka and Kyle Lowry scored 20 points each – Lowry returning after missing a game with a sore back. Karl-Anthony Towns scored 26 points and pulled down 18 rebounds for the Timberwolves, his two free throws with 15.7 seconds left knotting the score at 106-106.